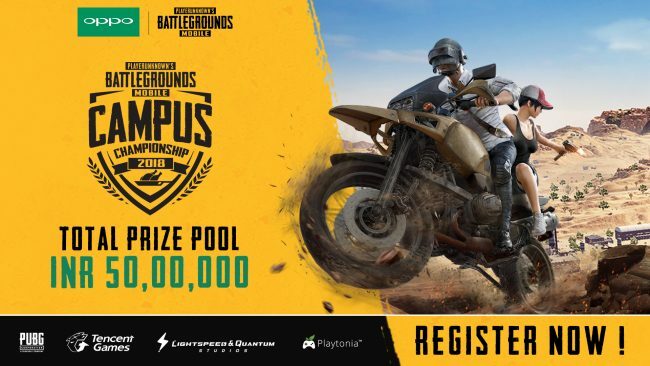 Tencent Games has announced eSports Championship -PUBG MOBILE Campus Championship 2018 in partnership with OPPO India. This eSports tournament will run for a month from 26th September 2018 to 21st October 2018, culminating in the grand finals to be held in Bangalore. According to Tencent Games, this championship will feature more than 1000 colleges from 30+ cities across the country in the mega tournament. With a prize pool of INR 50 Lakhs sponsored by OPPO India, the championship will be streamed across social media platforms to enable eSports enthusiasts across the country to view and follow the championship. Squads of 4 from any campus in India can participate and compete. Four knockout rounds including the semi-finals will shortlist the final 20 teams to compete for the ultimate trophy at the grand finals. Registrations will be open via the official website www.pubgmobile.in from 7th September 2018 till 23rd September 2018. PUBG MOBILE has become one of the most played games in India and has already crossed 100 Million downloads globally and launched Season 3 of the Royale Pass earlier this month, which skyrocketed the game to No. 1 position in Top Grossing category among all Apps of Google Play.